As we welcome back Nick from his expedition to Cambodia, we say goodbye to Lizzie, who is leaving Collective after 5 years to start a PhD at Edinburgh University. Lizzie will be continue to be involved in the Trails and Tales Project, a 3 year arts and heritage learning programme which will engage artists with communities to explore their local history and heritage. During the Past 5 years Lizzie has been involved in a number of projects, ranging from housing to smaller arts strategy work. 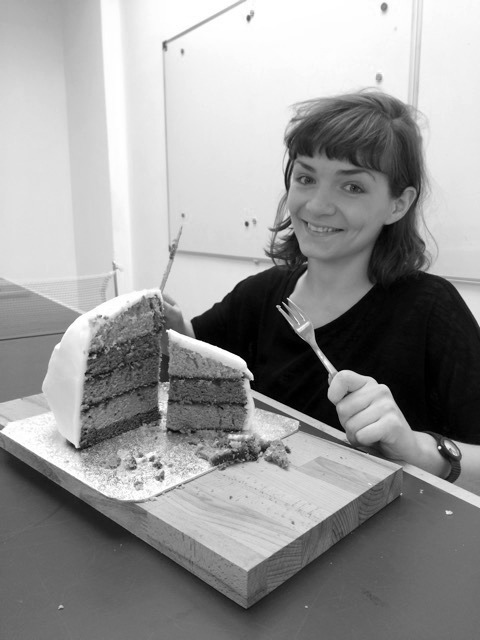 Carrying on the Collective tradition of architectural cake building, she produced a cake inspired by her Maryhill Arts Trail project, which comprises a series of cast concrete boulders inlaid with brass detailing. Lizzie has been a pleasure to work with and we look forward to hearing more from her research!